Many lines of work involve regular physical labour, including construction. This can cause you to build up a sweat, particularly when wearing a plastic, sticky hard hat and working outside in the sun. The Techniche HyperKewl Evaporative Cooling Crown Cooler attaches to your hard hat. 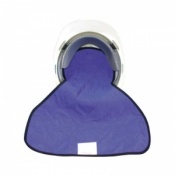 Constructed from a unique fabric which absorbs and slowly releases water through evaporation, this product delivers cooling relief to the head for several hours, to keep you cool as you work. Lightweight and durable, the crown cooler uses a low cost, reusable cooling system. 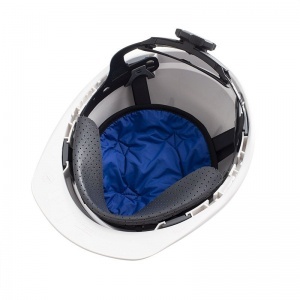 It features a hook and loop attachment, able to easily fasten to the inside of your hard hat to keep you cool. That way you stay fresh and focused while you work for maximum productivity. Simply soak the HyperKewl Crown Cooler in water for 1 - 2 minutes, before gently squeezing out (without twisting) the excess water. HyperKewl Evaporative Cooling products utilise a unique chemistry to achieve rapid absorption and stable water storage. 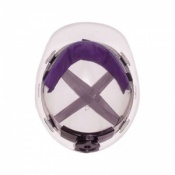 The crown cooler releases its energy over time, keeping the wearer cool and comfortable for 5 - 10 hours.